Straightforward stories that introduce children to the grand sweep of history! 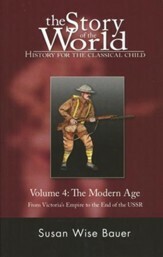 This multilevel one-year curriculum for grades 1 to 4 covers ancient to modern times—from the dawn of civilization to the downfall of the Soviet Union—within the four volumes. Parents can read the text aloud to younger children or older children can read independently. The corresponding activity books (sold separately) feature lots of projects, comprehensive questions, mapping, timelines, games, and crafts. Also included is a helpful reading list of fiction and nonfiction titles to enrich your child’s understanding of the time period. Tests are sold separately, too, for parents who want to see how students are retaining the material. My kids and I loved reading together and doing the projects. With so many great stories and activities to enjoy, there is something for everyone. This program can be used by the whole family to learn together! Approx. 350 pages each, softcovers. This reading program was a favorite of my youngest daughter, Kaelyn. She enjoyed the many different literary genres that were incorporated and the color pictures throughout the book, often rereading the stories, poems, and plays in each level. I remember “Mort and the Sour Scheme”(in the fourth grade reader), a fun story about rotten food in a refrigerator (which my kids know is usually in the back of my fridge!). The rotten foods talk about how they don’t like when people let them spoil, so they hatch a plot to kidnap Miss Sweet Sugarbowl, who is never ignored. My daughter read this story so many times, I thought she could recite it word for word! A workbook helped her with comprehension, phonics review, and skills needed to study literature. The teacher’s edition equipped me with an easy-to-follow lesson plan. This guide also provides vocabulary, literal, critical, and interpretive questions and background information to help enrich the student’s learning. All of these aids made teaching this course a breeze for me. I had all the information I needed, with very little prep time required. Our family kept these readers for many years, in order to read the stories again and again. I only wish I had saved them to read to my grandchildren! This 2-year history course is not your standard textbook curriculum. It's designed for middle school to high school students, but many parts can be used by your entire family. The teacher's guide offers activities and reading lists for kindergartners to adults, and features instructions for adapting the material for younger students. The activity book includes work sheets and review pages for concepts and units that can be used as quizzes or tests. The teacher's guide provided me with weekly lesson notes, background information, book lists, answer keys, and activity ideas such as timelines, mapping, study projects, writing assignments, research topics, and even review games for family nights. You could never do all the supplemental work within this curriculum, but it sure was fun trying! My family and I loved using this resource because it made history so interesting. Even studying World War II gave us an excuse to watch one of our favorite movies, The Sound of Music, together. I like that this course features selections from all literary genres. Each grade level covers plays, short stories, poems, and novels, so my children were exposed to different authors and classic pieces within each themed level. They were challenged to learn literary terms, and encouraged to analyze the material to apply it to their own lives. The very thorough teacher's guide-with its easy-to-follow lesson plans-provided me with background information, explanations of the material, answers to all the work, and additional activities for my children if needed. It made teaching this program a breeze! It also allowed me to have all the information needed in one place with very little prep time. The separate test book helps you gauge your student's comprehension of the material. My children and I enjoyed this easy-to-use and interesting literature course throughout their middle and high school years. Student texts include brief introductions to each section; questions; and biographical sketches of authors. Teacher's editions include full-sized student pages, materials for biblical analysis and application, discussion questions, writing activities, and answer keys. One of my children struggled with reading and spelling. Sequential Spelling's multilevel and multi-grade approach allowed my daughter to improve her skills faster than a standard program by using word families. Starting with the root word, she was tested daily. By the end of the week, she progressed to a more complex word. She improved her reading skills too because the words are broken down phonetically. She surpassed a few grade levels within the year at a very relaxed pace. Even though the student is given a spelling test every day as part of the curriculum, this test requires no prep or studying ahead for the student or parent. It allows practice with the building of the root words with no pressure of a grade. I wish I had known about this easy-to-use spelling program for my older children! Two softcovers each, from Wave 3 Learning. This history and geography course for grades 5 to 8 covers America from its beginnings to the present. My children and I learned a great deal about America’s landmarks, natural resources, and our past and present leaders, but this course really came to life for us through the accompanying book, We the People. Based on personal journals and real accounts from people in the past, it includes famous speeches and documents for us to review and study. This was a fun way for my kids to learn about America past and present. Includes two hardcover student textbooks, book of primary resources, timeline book, maps, and answer key. From Notgrass. P.S. This curriculum also offers two workbooks that are sold separately. The Lesson Review provides daily review questions and weekly tests to help the student retain the information. 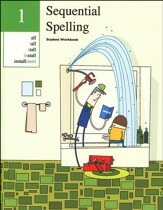 The Student Workbook includes fill-in-the-blank activities, drawing, and other handwork sheets.